The wlanHEMUConfig object specifies the transmission properties for the multiuser IEEE® 802.11™ high efficiency (HE) format physical layer (PHY) packet. Create a wlanHEMUConfig object. Modify the default setting for the GuardInterval property. Properties of each resource unit (RU), specified as a cell array. When you create a wlanHEMUConfig object, the RU cell array is configured based on the defined AllocationIndex input argument. Power boost factor, specified as a scalar in the interval [0.5, 2]. Spatial mapping scheme, specified as 'Direct', 'Hadamard', 'Fourier', or 'Custom'. The default value 'Direct' applies when NT and NSTS_Total are equal. NT is the number of transmit antennas and NSTS_Total is the sum of space-time streams for all users assigned to this RU. When specified as a matrix, its size must be NSTS_Total-by-NT. The spatial mapping matrix applies to all the subcarriers. NSTS_Total is the sum of space-time streams for all users assigned to this RU, and NT is the number of transmit antennas. When specified as a 3-D array, its size must be NST-by-NSTS_Total-by-NT. NST is the number of occupied subcarriers, as determined by the RU size. Specifically, N ST can be 26, 52, 106, 242, 484, 996, or 1992. NT is the number of transmit antennas and NSTS_Total is the sum of space-time streams for all users assigned to this RU. Enable signaling of a transmission with beamforming, specified as a logical value. Beamforming is signalled when this property is set to true. The SpatialMappingMatrix property specifies the beamforming steering matrix. Resource unit size, specified as 26, 52, 106, 242, 484, 996, or 1992. This property is read-only after the object is created. Resource unit index, specified as a positive integer in the interval [1, 74]. This number is used to indicate the location of the RU within the channel. Example: In an 80 MHz transmission there are four possible 242 tone RUs, one in each 20 MHz subchannel. RU# 242-1 (Size = 242, Index = 1) is the RU occupying the lowest absolute frequency within the 80 MHz, and RU# 242-4 (Size = 242, Index = 4) is the RU occupying the highest absolute frequency. User index number transmitted on this RU, specified as a positive integer in the interval [1, 8]. This number is used to index the appropriate User cell array element within the wlanHEMUConfig object. User properties of each assignment index, specified as a cell array. When you create a wlanHEMUConfig object, the User cell array is configured based on the defined AllocationIndex input argument. APEPLength is used internally to determine the number of OFDM symbols in the data field. For more information, see 802.11 802.11-17/1001r4. Number of space-time streams (NSTS) in the transmission, specified as a positive integer in the interval [1, 8]. The maximum NSTS summed over all users is 8. Additional restrictions are enforced based on spatial configuration as specified in Table 28-1 and 28-27 of IEEE P802.11ax™/D2.0. The RU object defines a single-user RU. Station identifier, specified as a nonnegative integer in the interval [0,2047]. This value specifies the STA association identifier (AID) field as defined in IEEE P802.11ax/D2.0, Section 27.11.1. The 11 LSBs of the AID field are used to address the STA. When STAID is set to 2046, the associated RU carries no data. RU number, specified as a positive integer in the interval [1, 8]. This number is used to index the appropriate RU objects within the wlanHEMUConfig object. Enable space-time block coding (STBC) of the PPDU data field for all users, specified as a logical value. STBC transmits multiple copies of the data stream across assigned antennas. The NumSpaceTimeStreams property is 2. The DCM property is false for all users. Modulation and coding scheme for the HE-SIG-B field, specified as a nonnegative integer in the interval [0, 5]. Enable DCM for the HE-SIG-B field, specified as a logical value. This property applies only when the MCS property is 0, 1, 3, or 4. Uplink indication, specified as false or true. Specify UplinkIndication as false to indicate that the PPDU is sent on a downlink transmission. Specify UplinkIndication as true to indicate that the PPDU is sent on an uplink transmission. This property applies only when the HighDoppler property is true. Channel bandwidth, specified as 'CBW20', 'CBW40', 'CBW80', or 'CBW160'. When you create a wlanHEMUConfig object, this property is configured based on the defined AllocationIndex input argument. Resource unit (RU) allocation index, specified by one, two, four, or eight integer values in the interval [0,223]. You can specify this value as an integer, a vector of integers, a string array, a character vector, or a cell array of character vectors. The format in which you specify these indices depends on how many you are specifying. An 8-bit binary sequence specified as a string or character vector. The allocation defines the number of RUs, the size of each RU, and the number of users assigned to each RU. For more information, see OFDMA Allocation Index. Enable lower center 26-tone RU allocation signaling, specified as a logical value. Using name-value pairs when the object is created, specify LowerCenter26ToneRU,true to enable the lower frequency center 26-tone RU. This property can be set during object creation only. This property applies only when the AllocationIndex property defines a channel bandwidth of 80 MHz or 160 MHz and does not specify a full bandwidth allocation. Enable upper center 26-tone RU allocation signaling, specified as a logical value. Using name-value pairs when the object is created, specify UpperCenter26ToneRU,true to enable the upper frequency center 26-tone RU. This property can be set during object creation only. When you create a wlanHEMUConfig object, the properties are set based on its AllocationIndex input property and any Name,Value pairs included in the syntax. Upon creation of the object, RU and User cell arrays are configured. The RU cell array elements contain the configuration properties for each RU. The User cell array elements contain the configuration properties for each user. 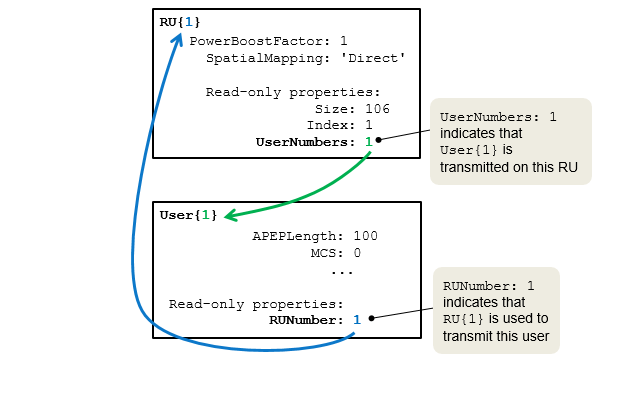 The RU.UserNumbers property indicates which users are transmitted on each RU. 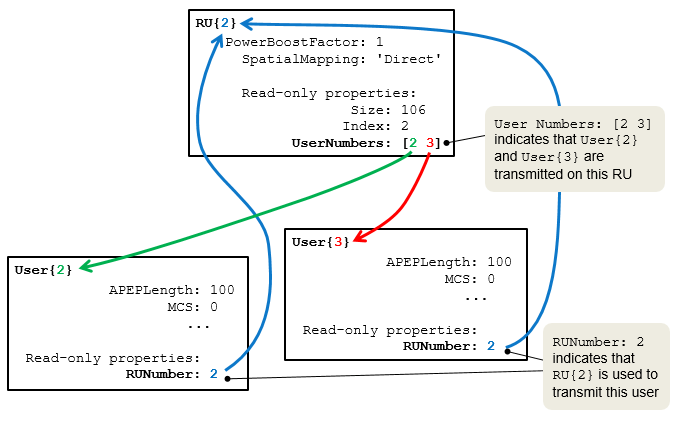 The User.RUNumber property indicates which RUs are used to transmit data for each user. As shown here, an RU can be assigned to multiple users. After creating the wlanHEMUConfig object, you can modify some of the RU and User properties but other RU and User properties are read-only. 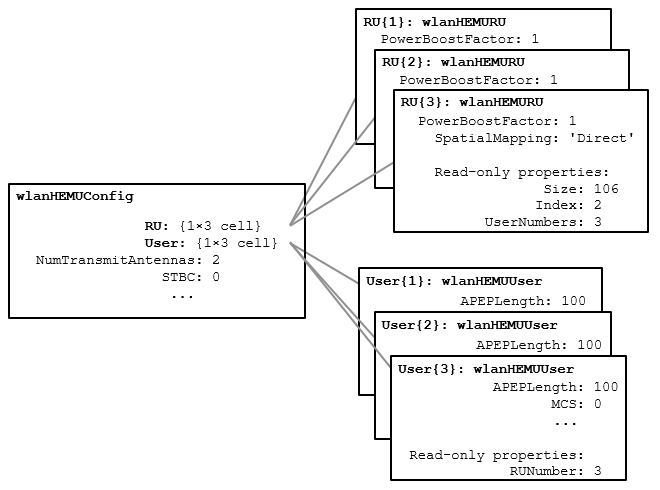 See wlanHEMUConfig Properties for RU and User cell array details.